There is a bit of hockey history not much known outside of Northern Minnesota and Western Canada, but one which needs to be told. It is the story of the most successful senior hockey team in the United States. It is also the story of one man's dedication to Canada's national game in small-town America and how that dedication could turn this same small town into a producer of top hockey talent for half a century. Warroad is a community of some 1,700 people located in Northwestern Minnesota on the shores of Lake of the Woods about 11 miles south of the Manitoba border. Its principal industrial firm is Marvin Windows, a major enterprise which markets products internationally. Agriculture, logging, fishing, and the manufacture of hockey sticks are other commercial activities. The Marvin family has historically played a significant role in the communities life. Most notable are the brother Bill, Tut (Randolph), Jack, and Frank along with sister Mary. Bill is the now retired mastermind behind Marvin Windows which employs 3,000+ people, Tut is similarly retired as a company vice president, Jack is also a vice president who handles the firm’s lumber and hardware retail operations, while Frank, now deceased, was in charge of the company’s Canadian operations. Mary left Warroad early for a career in Minneapolis-St. Paul. However, by far the best known family member is Cal, who has owned and operated various motels and restaurants in the community. What he also has operated with a successful passion for 50 years is the Warroad Lakers Hockey team. Cal Marvin came back from WWII service with the Marine Corps where he participated in some of the most grueling of the South Pacific campaigns. He had played hockey before the war and Cal's team went on to win the Senior "A" Championship in 1950-1951 with the Crookston Pirates. Cal and others from the area were anxious to renew their part-time ice careers. Along with Dan McKinnon of nearby Williams, he approached the University of North Dakota in Grand Forks about starting a varsity program. The University accepted the idea and thus was born not only the Fighting Sioux, but the Warroad Lakers. The young men of Warroad and environs spent three to four years playing college hockey and drove home on Sundays to play for the Lakers. The team’s name came from the nearby Lake of the Woods. The first Laker team had thirteen players and besides Marvin and McKinnon featured Clarence Schmidt, also from Williams, who had a brief wartime stint with the Boston Bruins, and Gordie Christian, who would later play for the 1956 U.S. Olympic hockey team. Rube Bjorkman, another early Laker, played for both the 1948 and 1952 U.S. Olympic teams. They played their home games on an outdoor rink behind the school and wore the colors of the Boston Bruins. There were no masks, mouthguards, helmets or Zambonis. The Lakers played in the States-Dominion League for three years and continued to play on outside artificial ice until November 1949 when the Warroad Memorial Arena was opened. 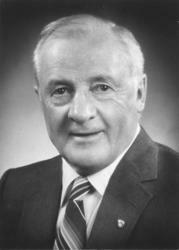 Cal Marvin had led the effort to build an indoor arena as a parellel activity to his involvement with the team. Fundraising efforts began on February 20, 1947 and the project was completed for a cost of only $30,000, as all labor was donated. The building was erected as a memorial to those who had died in the service of their country. It seated 1,800, but did not have the luxury of locker rooms at first. The players would change across the street in a local business and then walk to the arena. An artificial ice plant was added in the late 1960’s. By the 1950-1951 season the team was playing in the Northwest Hockey League with Crookston, Roseau, Hallock, Thief River Falls, and Grand Forks. This would be the first of many league changes over the team’s history. 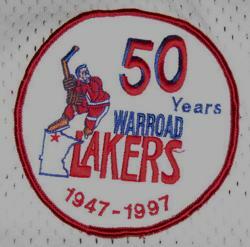 The first significant achievement for the Lakers occurred in 1955 when they won the United States Intermediate Championship against the Great Falls Americans in the Montana city. The following year saw the club play the U.S. Olympic team for the first time, losing 6-2 in Eveleth, MN. In 1958 the town was christened with the nickname “Hockeytown USA” by their mayor Morris Taylor. Cal Marvin, who was now coaching the team exclusively, took a year’s sabatical to go behind the bench for the 1957-1958 U.S. National team. The Marvin-coached Nationals finished fifth at the World Championships in Oslo and then became the first U.S. sports team to tour the Soviet Union after WWII. When Marvin returned to Warroad the next season he coached the Lakers to a 7-1 victory over the Nationals in Warroad. The late 1950’s saw Laker Sammy Grafstrom named Rookie of the Year in the Ontario-Minnesota League and the team featured such former NHL players as goaltender “Sugar” Jim Henry (New York Rangers/Boston Bruins), and defenseman Ed Kryzanowski (Boston Bruins/Chicago Blackhawks). Somewhat before this time, Bob Johnson, who would later coach Wisconsin to three NCAA titles and Pittsburgh to a Stanley Cup in 1991 vs. the Minnesota North Stars. Johnson played for the Lakers when he was coaching Warroad High School. As the decade closed the team abandoned the Boston Bruins’ black and gold colors and adopted red, white and blue. Running a senior hockey team was always financially challenging and the club resorted to community auctions, bingo games, turkey shoots, fishing contests, and even a “male” style show to raise funds. The Lakers continued to be successful in league play (see Laker achievements), as they expanded their international activities. One of the most significant events in Laker history occurred in January 1960 when they defeated the U.S. Olympic team 6-4. A few weeks later this same U.S. team won an upset gold medal at Squaw Valley, CA. Laker players and brothers Bill and Roger Christian were in the U.S. lineup following in the footsteps of their brother Gordie, and Dan McKinnon who were on the 1956 team. In March 1962, both the Swedish and Norwegian teams visited Warroad on their way to the World Tournament in Colorado Springs, CO. It was a return trip for the Swedes who had stopped in Hockeytown in 1960. The Christian brothers returned to the U.S. Olympic team in 1964, but got back in time to join the Lakers as they accomplished another significant milestone by capturing the Canadian Intermediate title by defeating Kamloops, BC, and taking the Edmonton Journal Trophy. They thus became the first American based team to win a Canadian amateur hockey championship. The previous year, long time Laker Board member John Heneman began keeping statistics and while the early records are a bit lean they do show that Bill Juzda, a member of the Stanley Cup winning Toronto Maple Leafs 1948-49/1950-51, was in the Laker lineup in 1964-65 and for a limited number of games the following year. “Hockey sticks by hockey players”, the trademark phrase for Christian Brothers, Inc. got underway in 1964as the two brothers launched their stick making business. The Lakers reached the Western Canada finals of the Allan Cup in 1965 before losing to Nelson, BC. While the Lakers achieved success in the Manitoba Senior Hockey League during the remainder of the decade their Canadian Intermediate victory and defeat of the 1960 U.S. Olympic team were the highlights of the 1960’s. Henry Boucha, an outstanding Warroad High School player, had a brief Laker career in the early 1970’s before joining the 1972 silver medal U.S. Olympic team. Boucha went on to play with the Fighting Saints, Detroit Red Wings and Minnesota North Stars before an eye injury brought a premature end to his career. Another Laker milestone occurred in 1974 when the team won its second Canadian Intermediate title by defeating the Embrun, Ontario Panthers, three games to zero at nearby Roseau, MN. This achievement earned them the Hardy Cup, a trophy not in existence at the time of their first Intermediate victory in 1964. While Canadians might not be happy with a U.S. victory they would take considerable pride in the fact that fifteen of the twenty Lakers were from north of the border. Earlier in 1974 Roger Christian was honored on a special day for his eighteen years’ of service with the team. Blaine Comstock, a backup goaltender on the Hardy Cup team went on to play for the United States in the 1976 Winter Olympics. Success at the Intermediate level continued in the late 1970’s as the club was the Western Canadian Intermediate Champions in 1977 losing to Campbellton, NB, in the finals. In 1979 they reached the Western Canadian Intermediate finals before losing to Quesnal, BC. As the 1980’s opened Laker fans were pleased to see one of their own on the U.S. Olympic team once again. Bill Christian, son of Bill (who had retired after the 1979-80 season), was part of the “Miracle on Ice” as the United States won a surprising gold medal in Lake Placid. He subsequently played sixteen years in the NHL with Winnipeg, Washington, Boston, St. Louis, Chicago and ended his career with the Minnesota Moose of the IHL. The Olympic team visited Warroad in both 1980 and 1984 while the Lakers tied the 1983 U.S. National team 6-6. The 1983-94 team toured Europe and compiled a 5-0 record against teams in Holland, France, Austria and West Germany. That same year a second indoor rink was built in the town named the Olympic Arena. Under the chairmanship of Bill Christian, volunteers erected a metal building at a cost of $150,000. An ice plant was subsequently added later in the decade. The mid to late 1980’s saw the beginnings of league membership problems that would plague the club until the end. In 1985 the Lakers became members of the Southeastern Manitoba Hockey league, but their membership was contingent on a yearly vote and eventually that vote went against them. While the league cited travel problems as the reason for the ouster there would appear to be some basis for the belief that their success was the root of the problem. The Lakers won the league title in 1985, 1987, and 1989. In addition they were the Manitoba Intermediate Champions in 1989 and 1990. As the 1990’s began the Lakers’ found a home in the Central Amateur Senior Hockey League, known popularly as the CASH League. The price for membership was that the Lakers would not be permitted any players from Manitoba. It did not really matter as the homebrews were as successful in the CASH League as earlier teams had been in the Southeastern Manitoba Hockey League. The Lakers won the league title in 1991-92 and 1992-93 as well as advancing to the Allan Cup Final Four in both those seasons. In January 1992 the team took their second trip to Europe and finished with a 3-1 record against French, German, and Austrian squads. The following month Chris Imes became the ninth Laker to play for the United States in the Olympics when he suited up in Lillehammer, Norway. On July 23, 1993 a new arena-to replace the original Gardens-was formerly dedicated. Plans had begun back in 1989 for the new facility as the Old Gardens was a wood structure and it was feared it might be lost to fire or wind. As might be expected Cal Marvin headed up the steering committee and his efforts were aided considerably by a $500,000 gift from his brother Tut as well as another sizeable donation from brother Jack. The total cost of the new building was $4.5 million. The new Gardens played host to the Allan Cup Finals in April 1994, the smallest city ever to play host to the event and only the second United States venue with Spokane, Washington hosting the 1979-80 Finals. The Lakers had continued to play in the CASH League and after advancing through the various playoff levels they carried a 33-5 record into the finals. The team featured eleven former NCAA Division I college players including Steve Johnson (North Dakota), Chris Imes (Maine), Larry Olimb (Minnesota), and veteran Scott Knutson (Chicago Circle). The Lakers emerged victorious with a 5-2 win over the St. Boniface, Manitoba Mohawks. Warroad had won the Allan Cup on their own ice with an entire native born roster. The next year, after playing in the Southeastern Manitoba League, the Lakers returned to the Allan Cup Finals at Stoney Plain, Alberta. They defeated the host Eagles 3-2 on Wyatt Smith’s third period goal and the goaltending of Todd Kreibich. Stoney Plain was once again the opponent in the 1995-96 Finals at Unity, Saskatchewan. The Lakers played an independent schedule that season and were going for the three peat, a feat never before accomplished in Allan Cup competition. (Three Winnipeg victories from 1911-1913 were accomplished by two different teams) The Eagles scored the first goal, but it would be the only one they would get as Warroad responded with two goals in each period for a 6-1 victory and a third straight Allan Cup victory.